This article is part of my Chinese New Year 2019 compilation. 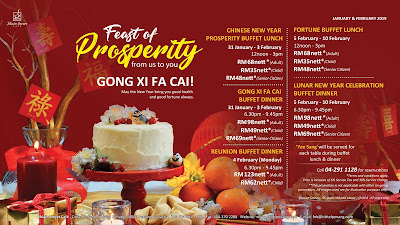 Special thanks to Cititel Penang for extending this food review invitation. 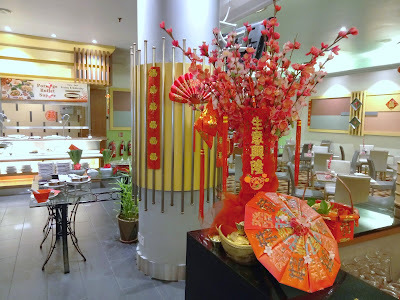 Cititel Penang is a 4-star hotel along Penang Road (Jalan Penang). 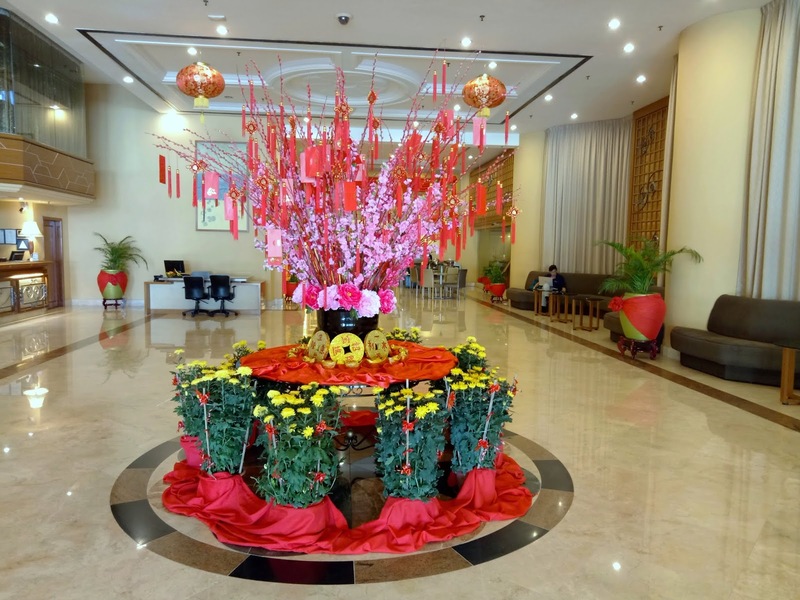 In spirit of the upcoming Chinese New Year, the hotel lobby is decorated with a centerpiece that features cherry blossoms with Chinese tassels. 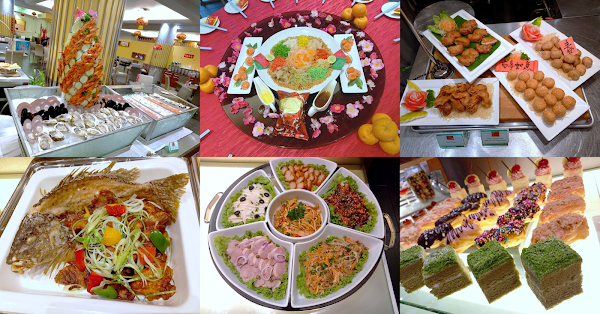 In addition, Cititel Penang will be serving a series of buffet lunches and dinners during the festive period. This evening, the hotel is giving us a sneak peek into the upcoming menu. Food is served in Main Street Cafe, the hotel's all-day dining restaurant. The meal begins with an attractive platter of Salmon Yee Sang. 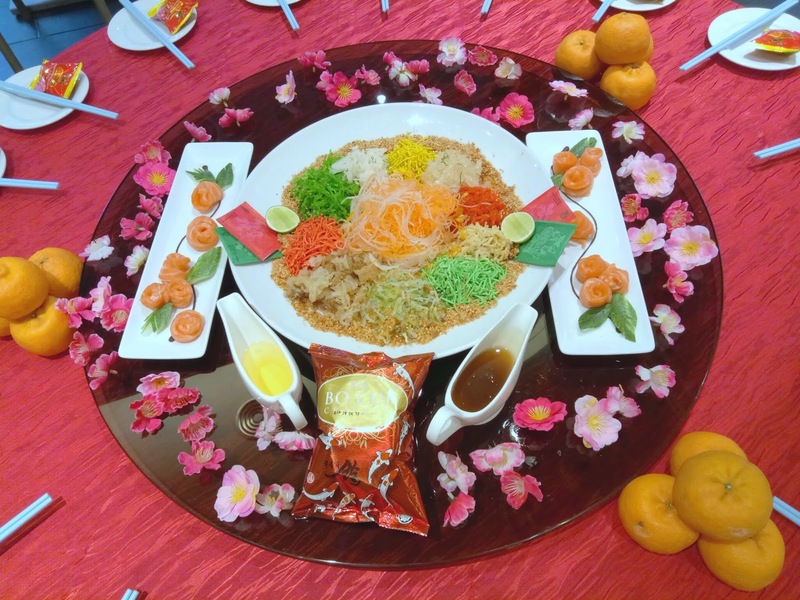 As per tradition, all diners gather around the table and toss yee sang (鱼生) into the air with chopsticks. 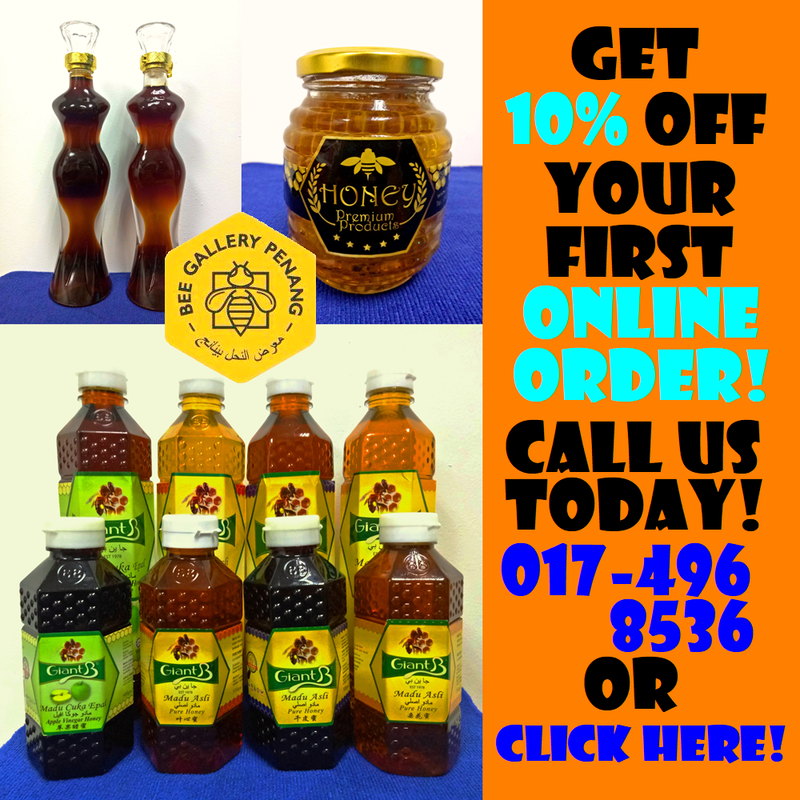 It is believed that the higher one tosses, the greater success one achieves in the new year. 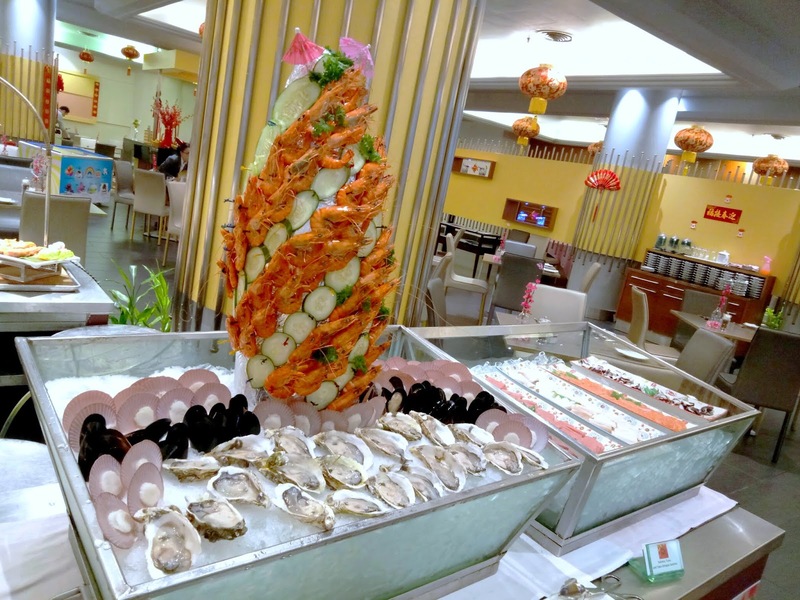 The buffet spread is dominated by seafood on ice. A towering centerpiece has large prawns held in place by toothpicks. 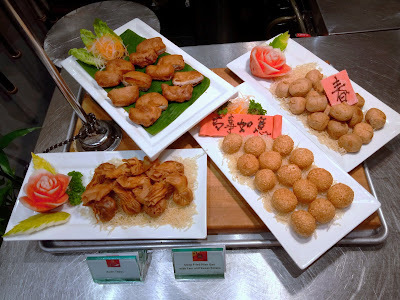 At the base, there are other marine delicacies like oysters, scallops and bay mussels. 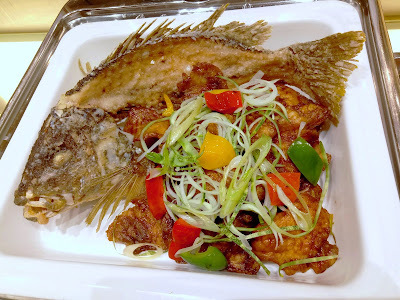 The Chinese consider fish to be auspicious especially during Chinese New Year. This belief is reflected in the Shanghai-Style Deep-Fried Fish. The snapper is cut into bite-size fillets for customers' convenience. 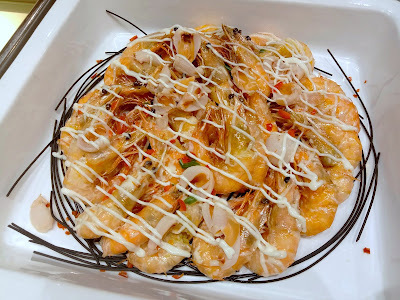 Wok-Fried Prawns are served with slices of lychee, whose sweetness I find quite peculiar. Meanwhile, chili flakes provide a lovely touch of spiciness. The dish is also drizzled with sweet mayonnaise. Soft-Shell Crabs are often served in Japanese restaurants. The oatmeal-crusted crabs are deep-fried until they become crispy. Curry leaves serve to enhance aroma. Personally, I feel that the crabs are not crispy enough. It would also be good if the pieces were made smaller. 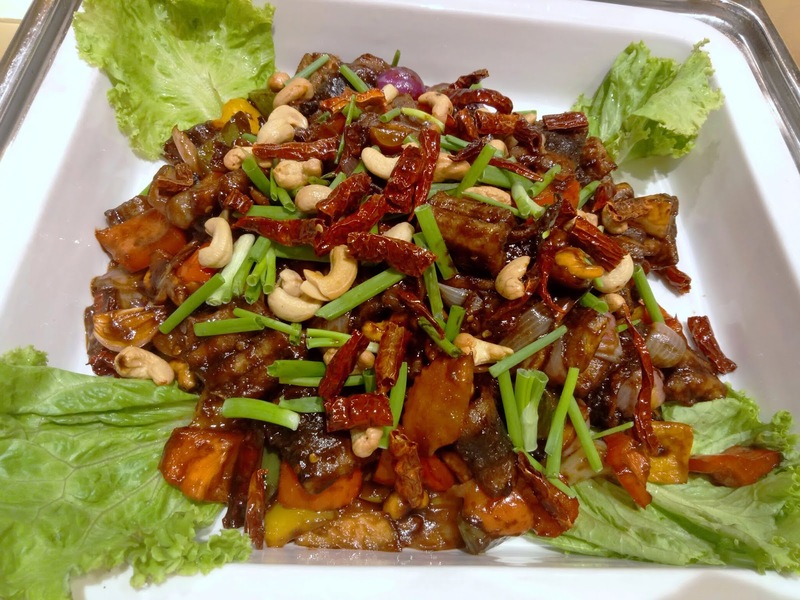 Yellow Eel is stir-fried with capsicum, shallots and dried red chili peppers. 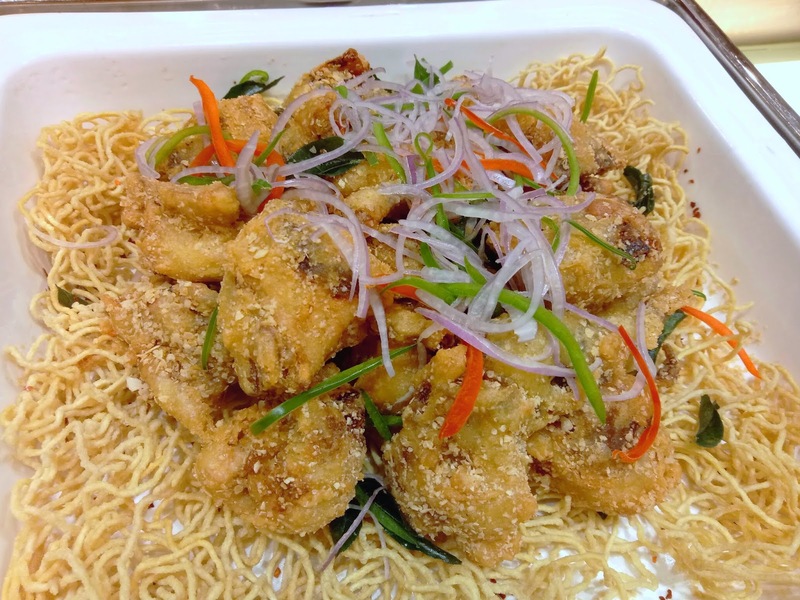 The dish is moderately spicy as long as you avoid biting chili peppers. Cashew nuts and scallions are used as garnishes. 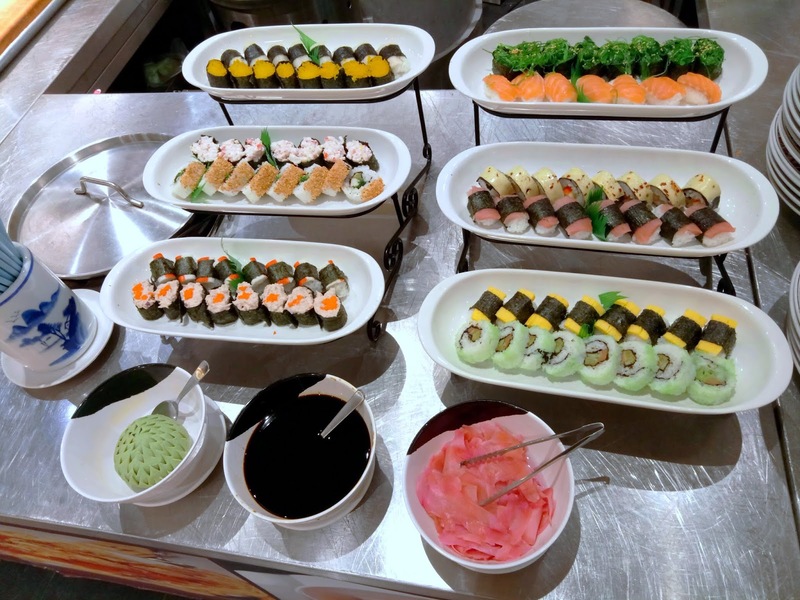 Japanese cuisine is represented by sushi (寿司), sashimi (刺身) and tempura (天ぷら). Japanese condiments like wasabi (山葵), pickled ginger (ガリ) and soy sauce (醬油) are provided. 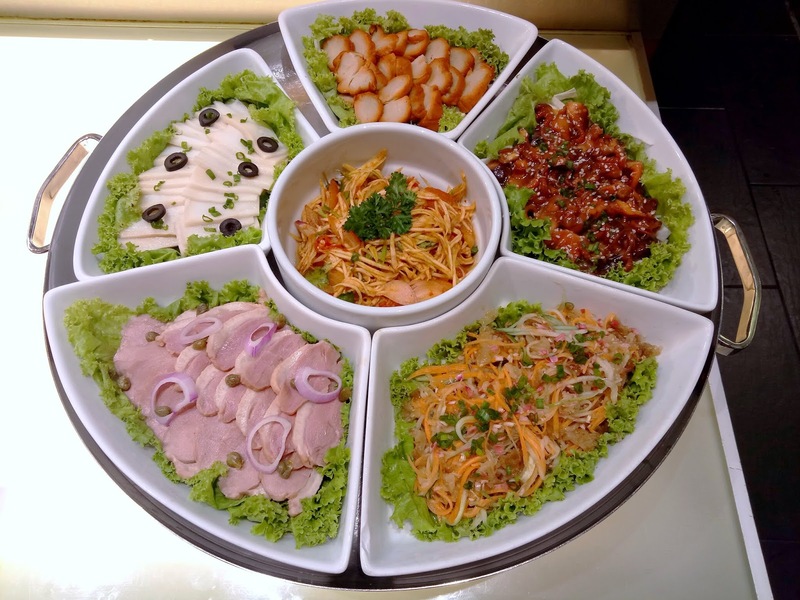 Moving on, the cold platter contains delicacies like smoked duck, abalone slices, vegetarian char siew, seasoned baby octopus and seasoned jellyfish. 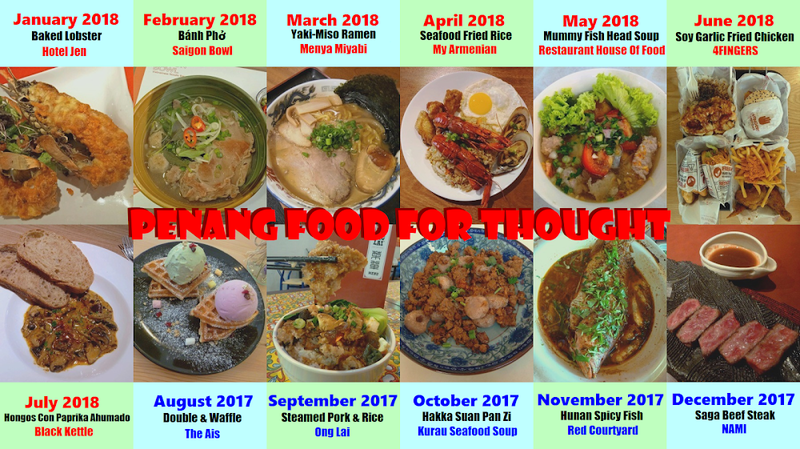 Prepared from glutinous rice, nian gao (年糕) is typically soft and sticky. 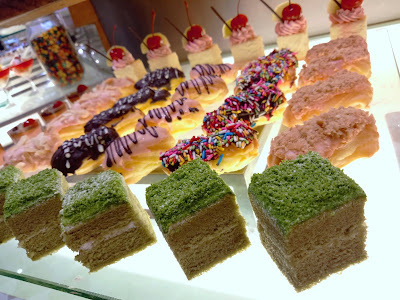 A popular way to enjoy this snack is by sandwiching nian gao slices with sweet potato and taro. 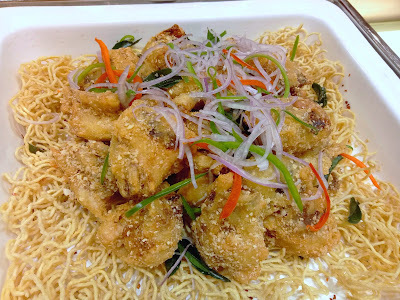 The sandwich is coated with batter, and then deep-frying until golden brown. 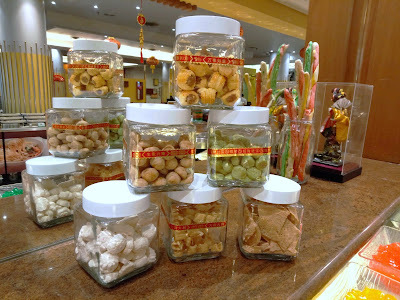 Other interesting snacks are sesame balls (煎堆), yam balls (炸芋角) and money bags (福袋). Diners are spoiled for choices when it comes to Chinese New Year cookies. Available today are pineapple tarts (黄梨酥), peanut cookies (花生饼), green pea cookies (青豆饼), tapioca cookies (番婆饼), beehive cookies (蜂窝饼) and love letters (鸡蛋卷). The cookies are kept in airtight jars to ensure that they remain fresh. As for Western pastries, there are cheesecake, green tea cake, brownies, éclairs, meringue tarts, crème caramel and dragon fruit mousse. 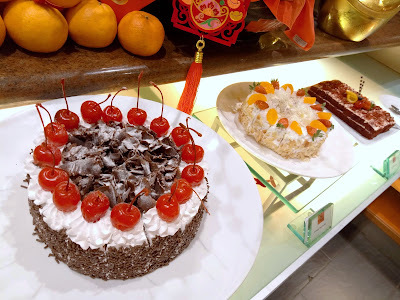 Diners who enjoy cakes can also help themselves with Black Forest Cake, Orange Shortcake, Red Velvet Cake, Orange Mirror Cake and Fruit Mousse. 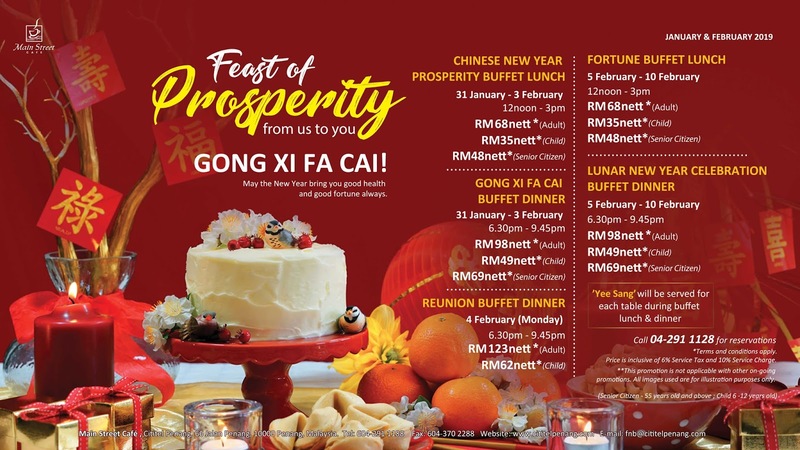 Cititel Penang's buffet lunch and dinner are served daily from 31 January 2019 to 10 February 2019, with the exception of Chinese New Year's Eve (4 February 2019) when only the Reunion Buffet Dinner is served. In all cases, yee sang is served at every table. 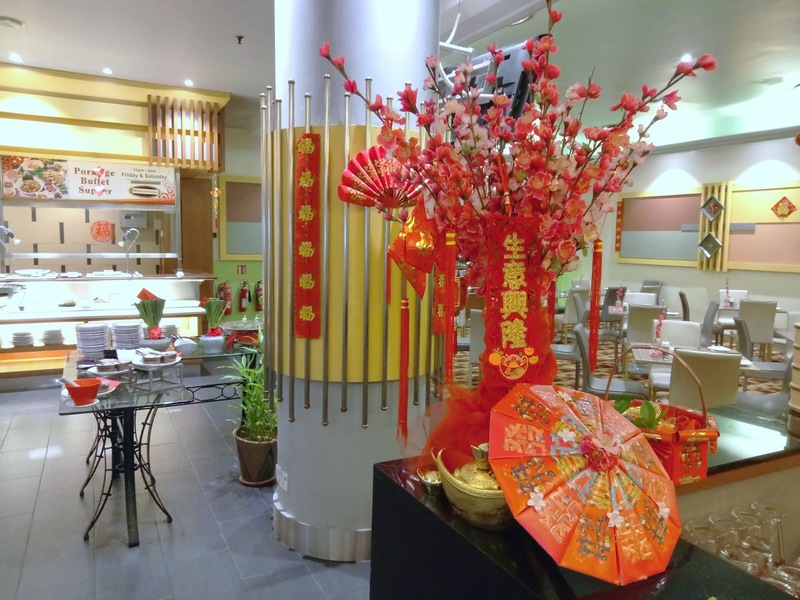 Directions: Cititel Penang is a 16-floor building at Penang Road (Jalan Penang). Main Street Cafe is located at the far end from the main entrance. To park, drive past the lobby and up the ramp to Level 2. Parking is charged at RM4.00 per entry.